Giving up your home when you retire to move in with relatives is often a difficult decision for all concerned. In the majority of cases, it will usually result in an aging parent moving in with their grown up children who may also have a family of their own to look after. And, whilst this may be the wisest option at the time and even if your grown up child is more than happy to accommodate you, there are a number of important issues that you’ll need to discuss first. You’ll need to ensure that there is sufficient room if you’re looking to move in with relatives. This is especially true if they have children as they shouldn’t be expected to share their bedroom with an older relative. If you suffer from any kind of mobility problems, it may well be that your relatives may have to install devices and to make other kinds of modifications to their home in order to accommodate you. And, if that’s the case, you’ll need to discuss the financial and practical issues surrounding that. However, if mobility isn’t an issue and you are independent and able to get about on your own, you need to look at the location of the property. If your relatives live in a rural area, for example, what provisions will there be to still get out and about to the shops? Do you have your own transport and, if not, is their home well served by public transport or are all of the usual community facilities and amenities within easy walking distance? Even if most things are accessible, you may need to consider things like the ease of access to maintain your social network and to pursue any hobbies you might have. One of the biggest considerations when moving in with relatives is how you will all still be able to have your own space and some privacy. This is a discussion which each member of the family should have a say in, including any children. If you are moving in with relatives, you’ll still want your own moments of privacy but you’ll need to respect that the rest of the family members will still need theirs too so some basic guidelines will need to be drawn up to ensure that you are not getting under each other’s feet. You might also need to establish some guidelines in terms of whether or not you’re able to invite friends over to your relatives’ home and, if so, what are the general ground rules about that. Many people opt to build an extension or even construct a separate building for the relative who’s moving in, a granny flat being a good example. Whilst this is often the best way of ensuring a harmonious existence is maintained, there will obviously be financial implications involved not to mention that planning permission might have to be obtained. If you’re moving in to live with relatives, there will also be additional day to day living expenses which they’ll be subject to for the additional costs of things like utilities and food. It’s important that you try to make a financial contribution to this if you’re able to and, if that’s not possible, your relatives may need to sit down and do their sums first to ensure that they can meet the costs of homing an additional person. There are so many considerations to think about and you’ll all need to sit down and discuss matters carefully to ensure that moving in with relatives is the best option for you and for them. No one wants to feel a burden to relatives and they, themselves, shouldn’t really feel a pressure to oblige. It can take a lot of re-adjustments on both sides to make an arrangement like this work but it can be achieved and there are positive benefits too. For example, you, as the retired person, may be in a position to help out around the house and with things like childcare or perhaps taking the children to school, which can ease the pressures. And, if you’re contributing financially, you may be able to help reduce the cost of living for your relatives which might be another pressure which is lifted off their shoulders. 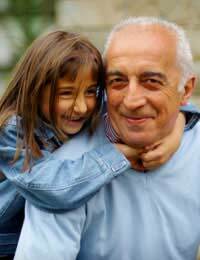 In some cases, it’s also an opportunity to forge an even closer bond with both your children and grandchildren later in life. The facts are, however, that issues need to be carefully thought through and agreed to by all for it to be a viable option on a practical, financial and emotional level for all concerned.